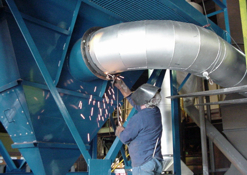 Sheet Metal Fabricators Servicing: Indiana, Ohio, Illinois, Michigan & Kentucky - Call Today For An Estimate! We encourage you to browse our web site by clicking on the buttons to the left to learn why Gensic Creative Metals should be your single source for precision sheet metal fabrication & installation. Our specialty in custom design and fabrication offers a total solution to all your metal needs. Our talented staff of sheet metal fabricators, designers and installers will work one on one with you to make sure that the "beginning to end" of your project is a smooth transition. We understand that it's not just your sheet metal projects, it's also our reputation! © All Rights Reserved 2005 - Website Development & Hosting Provided By: Cre8ive Productions, Sales & Service, Inc. This WebSite, (http://www.gensic.com) uses HTML 4.01 Transitional without Style Sheets and is optimized for Microsoft's Internet Explorer.